Do you want to add a Google Analytics dashboard for WordPress, so you can see your site’s stats at a glance? After connecting your site with Google Analytics, you can see your site’s important statistics and metrics in your Analytics account. But, if you’re new to the Analytics platform, you may find it difficult or tedious to go to the Analytics website to view your reports. In this article, we’ll show you how to add a WordPress analytics dashboard to your site, step-by-step. This’ll help you see your site’s important statistics and metrics directly inside your WordPress dashboard. Why Add a WordPress Analytics Dashboard? Google Analytics is the most commonly-used website analytics service that provides you with detailed reports about your site traffic and their behaviors on your site. Traditionally, you can install Google Analytics in WordPress by adding a tracking code in your theme’s header. But there’re several disadvantages to this method. First, it’s quite a tricky (and risky) process for beginners to add a code into WordPress. You should at least know how to access the theme’s header and how to insert the code properly. Otherwise, you can break down your site with guesswork. Second, you’ll have to visit a separate website (Google Analytics) each time you want to see your website reports. As you tend to be busy with content and customizations on your site, you may sometimes miss out on important traffic changes on your site. Third, Google Analytics platform can be overwhelming for beginners. Although you can find every form of information on it, it’s not very comprehensive for newbies. You have to dig around in it to view the reports you want to see. If you aren’t intimately familiar with its platform, you’ll get lost. Thus, you’ll need to add a Google Analytics dashboard for WordPress. Having a WordPress analytics dashboard on WordPress solves these problems, allows you have a quick view of your site stats, and gives you the ability to act instantly if something’s gone awry. Now, let’s go ahead and see how to add a Google Analytics dashboard to WordPress step-by-step. First, go to the MonsterInsights website and download the MonsterInsights plugin. MonsterInsights is the most user-friendly Google Analytics plugin and makes installing and using Google Analytics in WordPress simple and beginner-friendly. After you’ve downloaded the plugin, install it on your WordPress site. If you’re new to WordPress, you can follow our beginner’s guide to installing a WordPress plugin. After it’s installed, don’t forget to activate it. Once it’s activated, you’ll see an Insights menu added to your WordPress admin panel. Go to the Insights » Settings page from your dashboard and enter in your plugin license key. Next, you’ll need to connect your site with your Google Analytics account. 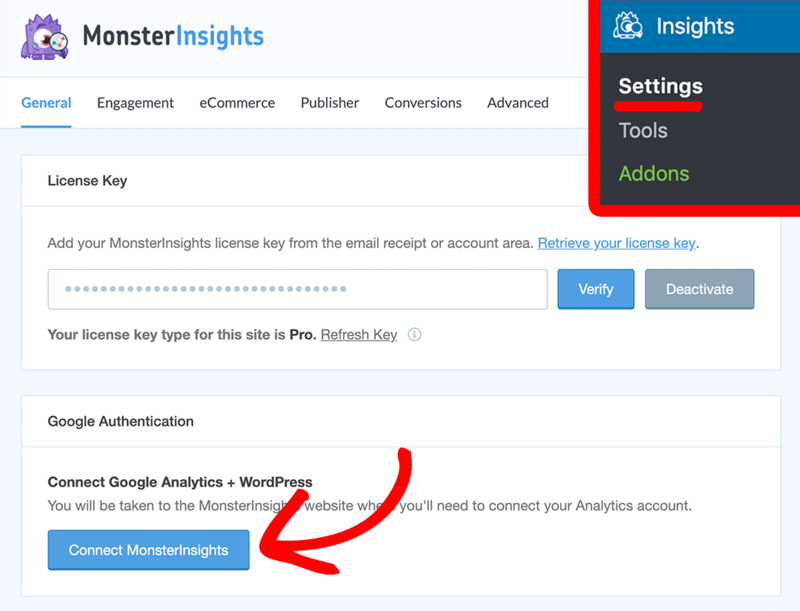 You can start the process by clicking the Connect MonsterInsights button below the license activation field. Then, it’ll redirect you to your Google accounts page. From there, you’ll need to sign into your Google account or select a Google account if you’re already signed in. 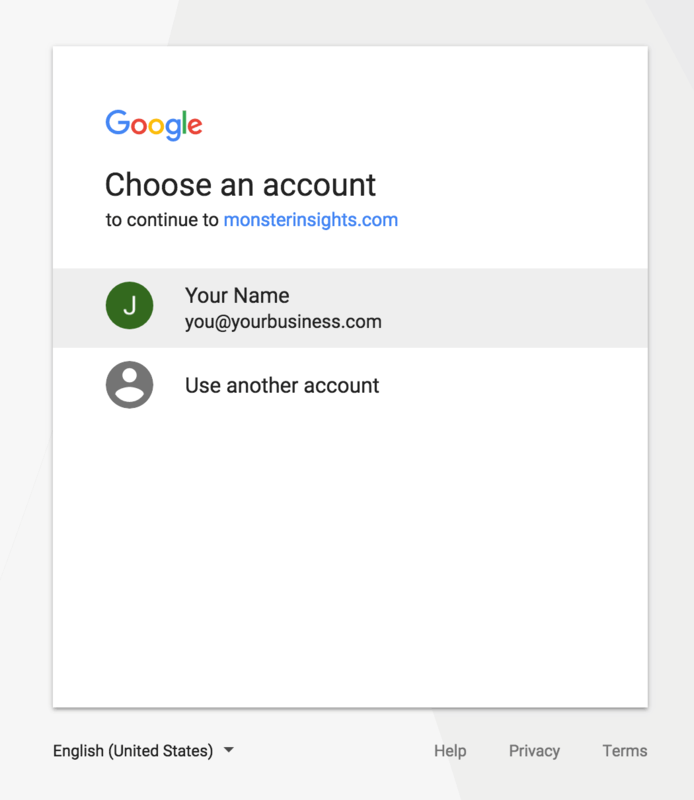 If you have multiple Google accounts, make sure you log into the account you used for creating your Analytics account. Next, you’ll be asked to allow MonsterInsights to access your Analytics account. You’ll need to click the Allow button to allow permissions. After that, you’ll need to select the profile for your site and confirm that you’re a human by clicking the I’m not a robot checkbox. Then, click the Complete Authentication button. That’s it! You’ve completed the setup process. Now, you’ll be redirected back to your WordPress dashboard. This process requires you to have a Google Analytics account already created. If you haven’t created your Analytics account yet, here’s our complete guide to creating an analytics account and setting up Analytics in WordPress. Now, let’s start with a quick overview of MonsterInsights Dashboard Widget. MonsterInsights’ Dashboard Widget makes it easy to view your site’s important statistics at a glance as you can view them right in your WordPress dashboard. After you log into your WordPress admin area (yoursite.com/wp-admin), you’ll see the dashboard widget. The plugin shows you the stats for the last 30 days by default. You can also view these for the last 7 days by selecting it from the drop down button. The dashboard widget is highly customizable and you can choose to show additional reports in the dashboard widget. You can add tabs from the Publishers report and eCommerce report to the dashboard widget by clicking the settings icon within the widget. Additionally, you can view the dashboard widget reports in full-screen mode. All you need to do to change the view to full-screen is click the blue cursor between the days switching drop down and settings icon in the MonsterInsights widget. Besides, MonsterInsights comes with beautiful custom dashboards inside your WordPress dashboard. If you want to view your site’s complete analytics reports, you have to go to MonsterInsights’ custom dashboards. It’s your Google Analytics dashboard inside your WordPress dashboard. To view your custom reports, visit Insights » Reports from your WordPress admin area. Then, you’ll see your site’s entire Analytics reports presented in a beautiful way. First, you’ll see the Overview report that includes your site’s total pageviews, sessions, top 10 countries, top referrals, top posts/pages, etc. There, you’ll see 5 more tabs on the top of the report. They’re the other categories of Analytics reports that help you to understand your website traffic stats. Overview Report: Total sessions, pageviews, top countries, top posts/pages, bounce rate, etc. Publishers Report: Top landing pages, top exit pages, outbound links, affiliate links, download links, demographics, etc. eCommerce Report: Your WooCommerce or Easy Digital Downloads powered shop’s conversion rate, transactions, revenue, top products, total add to carts, etc. Search Console Report: Top 50 Google search terms for your site with the details of clicks, impressions, CTR, and average position. Custom Dimensions Report: You can track custom dimensions link top authors, top keywords, top categories, custom post types etc. with ease and view reports on this tab. Forms tracking report: Your WordPress forms’ full reports with counts of impressions, conversions, and conversion rate for each form. 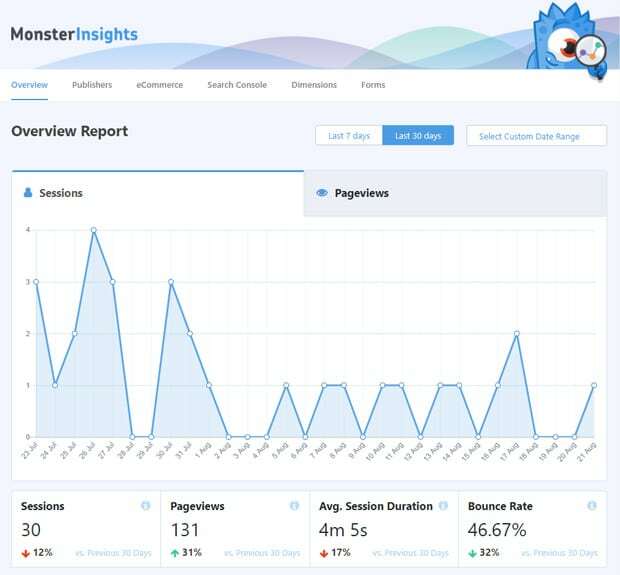 If you want a detailed guide, here’s our complete guide to MonsterInsights’ dashboard reports. First of all, MonsterInsights makes it easy to install Google Analytics in WordPress. Then, it automatically adds the Google Analytics dashboard in WordPress, so you can view your Analytics reports right in your WordPress admin area. Second, MonsterInsights plugin empowers you to configure Google Analytics by yourself and view important site metrics. Google Analytics, by default, doesn’t track advanced metrics like eCommerce, forms, downloads, etc. and the setup process without the plugin is very tricky. But you can do them all by yourself using MonsterInsights. Having all these important metrics inside your WordPress dashboard helps you to quickly review your website statistics and make better decisions instantly for your business growth. So, why wait? Install MonsterInsights and get a Google Analytics dashboard on your WordPress website. We hope this article helped you learn how to add a reporting dashboard on your WordPress site easily. You might also want to check out our guide on how to track links and button clicks in WordPress.